For those of you that follow my blog or know me personally, you may have pieced it together that I'm a big time fan of STAR WARS. 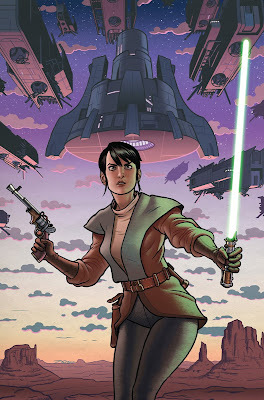 You can imagine my excitement when Darkhorse Comics approached me about illustrating the covers for a five-part miniseries they would be publishing this fall, called Star Wars: Knight Errant. It's a new Star Wars tale set 1000 years before Episode 1: The Phantom Menace. I'm pretty jazzed about it. Above is the cover to issue one due out this October. MTV just posted a big interview with the series' writer, John Jackson Miller. You can check that out here. Wonderful news, Joe! Good for you! This turned out GREAT Joe! I can't wait to see what you come up with for the other 4 covers. MTFBWY dude. You are living the dream, my friend. As a fellow Star Wars dork(ette) I congratulate you on an awesome opportunity! hate to say it, but she looks like she has to really go to the bathroom badly. The legs are a little too stuck together. It could also be that the shadowing makes them seem like they are tilted in toward each other. Maybe set them apart, with the right leg (my right as a viewer) coming down towards the right corner, and the left leg staying the same. This will cover one of your little buttes in the background, but it's a small sacrifice to avoid the "gotta go now!" look. Sorry to be so specific. Your stuff is so clean and perfect, that when I noticed these things I figured I should let you know. I appreciate the criticism, but this isn't a work in progress - it's already sent off to my publishers, sos I can't go back and make more edits. That said, I'm pretty pleased with how it turned out as it is, but again, I appreciate your take. Thanks! I just stumbled upon your work and was really blown away. I'm surprised I hadn't noticed it before. That's a great looking cover! I love your work. So much, in fact, that I'd like to get a tattoo of your Green Lantern from Wednesday Comics. Another artist told me it's a complement to do this, but I thought I'd clear it with you anyway, since it's your work. Any objection? Nice work on the cover! I'd like to get a tattoo of your Green Lantern from Wednesday Comics and feel like I should ask first, since it's your work. Is that cool?